Posts tagged "Fish Point Park"
Successful Community Clean Water Clean-Up! 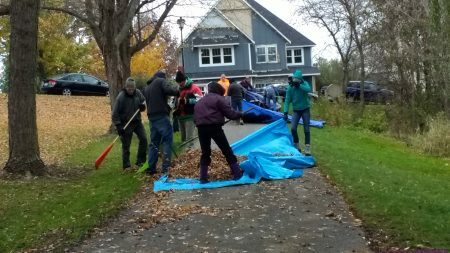 Nearly 45 volunteers braved near freezing temperatures to “Rake for the Lake” on Sunday, Nov. 5 at Fish Point Park in Prior Lake. 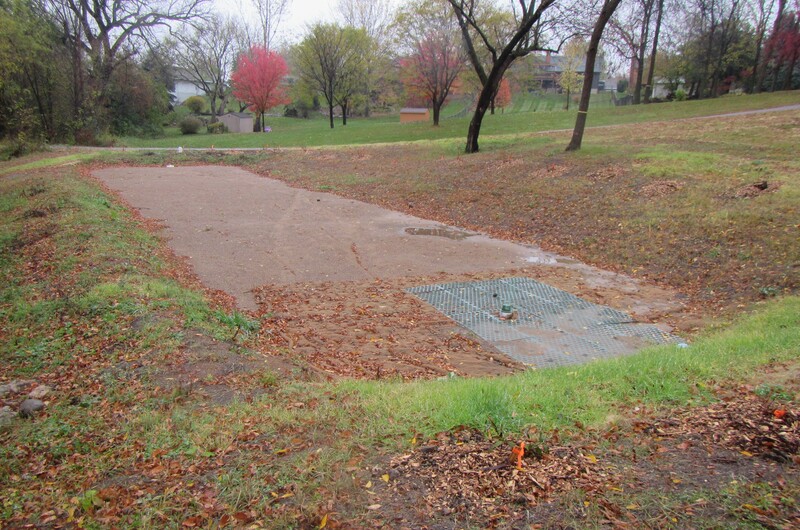 The clean-up was located at the park where the City of Prior Lake and the District just completed a water quality improvements project, which included native prairie plantings, wetland enhancements and installation of an iron-enhanced sand filter to treat incoming stormwater before it reaches Prior Lake. Volunteers represented the Cub Scouts, Savage Area Women of Tomorrow, Prior Lake Association, the Prior Lake-Spring Lake Watershed District’s Citizen Advisory Committee, the District’s Board of Managers, the Mayor of Prior Lake and the City of Prior Lake and were joined by dedicated neighbors and friends. The volunteers raked, blew and piled 1200 pounds of leaves that city staff removed and will use as a soil enhancement for their tree nursery. 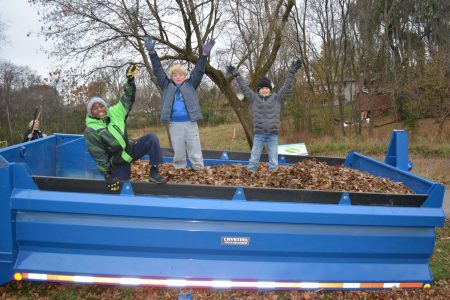 They also cut and pulled 880 pounds of buckthorn (one dump truck load) that was hauled to the Shakopee Mdewakanton Sioux Community’s Organic Recycling Facility (ORF). After the hard work was done, volunteers enjoyed hot beverages and snacks and had an opportunity to win a variety of great prizes donated by area merchants. To check out pictures from the clean-up visit our Facebook page! Fall and Spring Clean Water Clean-Ups are a Prior Lake tradition and this Fall’s clean-up was the seventh! 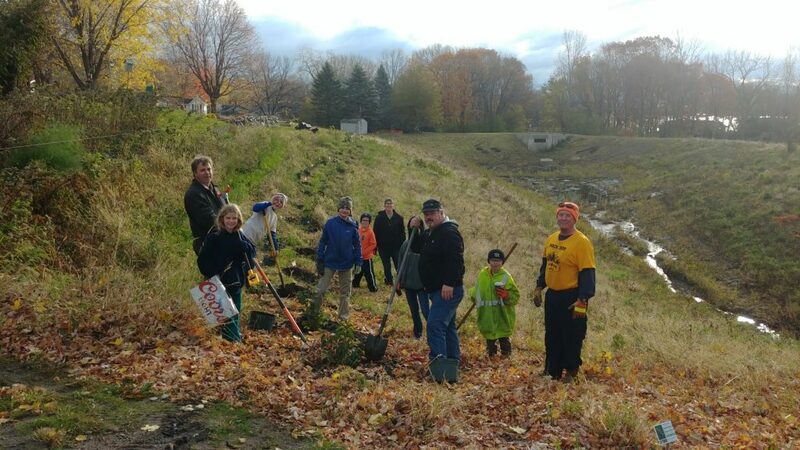 Clean-ups began in the fall of 2014 and organizers are looking forward to the Spring of 2018! If you missed out, email info@plslwd.org to be added to the email list for next spring’s event! Bring a Rake, Save the Lake. Join us Oct 29th! 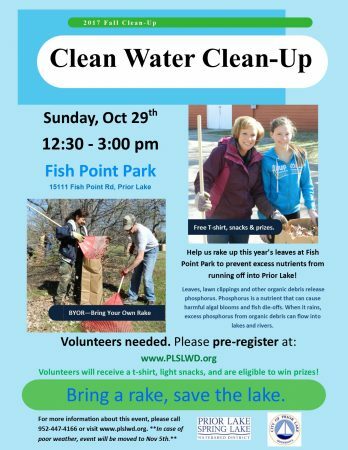 Join us for this fall’s Clean Water Clean-Up event at Fish Point Park in Prior Lake! Bring your rake on Sunday, October 29th at 12:30 pm. Help us rake up this fall’s leaves and remove buckthorn at the park. Volunteers will receive a free t-shirt and snacks will be provided. All volunteers will also be entered into drawings for prizes at the end of the afternoon. Sign-up and bring a friend! This event is family friendly. The event is free, but participants are asked to pre-register here by Friday, October 27th at noon to help with planning. Participants can, however, still sign-up at the event. This event is co-hosted by the Prior Lake-Spring Lake Watershed District and the City of Prior Lake. Each year, the Minnesota Association of Watershed Districts (MAWD) recognizes exceptional projects and acknowledges the outstanding work of Watershed Districts throughout the state of Minnesota with the MAWD Project of the Year Award. 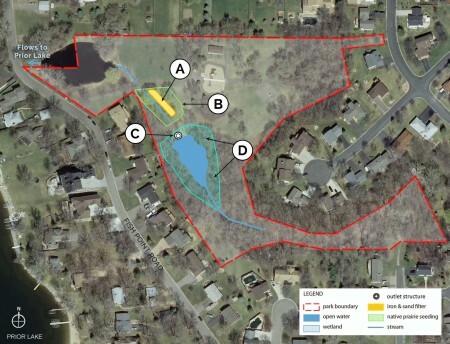 This year, the Prior Lake-Spring Lake Watershed District’s Fish Point Park Water Quality Project was one of three finalists for the award, announced at MAWD’s Annual Meeting in Alexandria on December 1. The project was completed through a partnership between the Prior Lake-Spring Lake Watershed District (PLSLWD) and the City of Prior Lake and partially funded by a grant from the Board of Water and Soil Resources (BWSR)’s Clean Water Fund program. Stormwater runoff from over 89 acres of land is funneled through Fish Point Park before it enters Lower Prior Lake, making it an ideal location for a stormwater treatment train. This project includes four elements: a wetland enhancement, a water control structure, a prairie restoration, and an iron-sand filter. Together, these four BMPs work to reduce the amount of phosphorus entering the lake by 34 pounds per year. Iron sand filter at Fish Point Park. 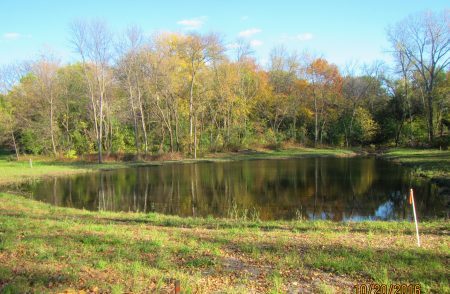 The last lake in the Spring and Prior chain of lakes, Lower Prior Lake is a regionally important recreational and ecological resource. Unlike the other two lakes in the chain, it remains off the Impaired Waters list and PLSLWD and the City of Prior Lake want to keep it that way. Given the urban watershed that surrounds this lake, significant actions to reduce untreated stormwater needed to be taken. 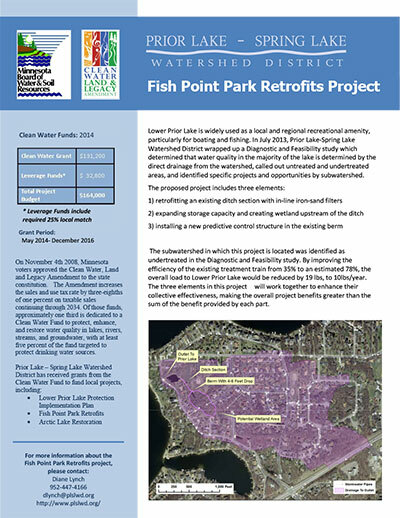 If you’d like to see the project for yourself, Fish Point Park is located west of Highway 13 at 15111 Fish Point Road in Prior Lake. 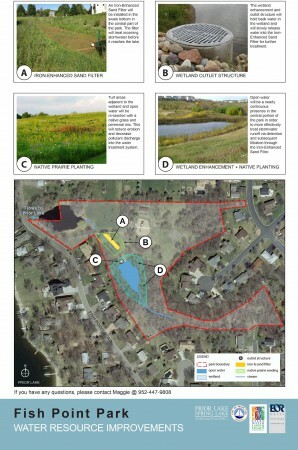 To learn more about the project visit the Fish Point Park project page on the District’s website or call the District at 952-447-4166.